The Class Notes page is a week-by-week accounting of what we discussed in class. It’s also where you can find links for further investigation into to topics, issues or questions that popped up during class. The Anthropocene describes the idea of a new geological epoch distinguished by the geological scale of human impacts on the Earth’s surface, atmosphere, oceans, and systems of nutrient cycling. Other organisms, like the cyanobacteria that oxygenated the atmosphere two billion years ago, have disrupted earth systems. But what does it mean, as Andy Revkin asks, to be “the first species that’s become a planet-scale influence and is aware of that reality?” How do we make sense of this? Does our status as a world-altering species evoke hubris or humility? And what does the shift from the predictable and habitable climate of the Holocene to the climate instability of the Anthropocene mean in terms of our future? So profound are the Anthropocene’s implications that the International Commission on Stratigraphy, the largest scientific organization within the International Union of Geological Sciences, has formed an ‘Anthropocene’ Working Group (AWG) tasked with developing a proposal to formalize the Anthropocene as a new geological epoch. The AWG will announce its recommendations later this year. In this course we will be searching at the intersection of art, activism and academics to find the places where new stories are emerging about who we are, how we might go about living the Anthropocene, and what this means for our future. Our journey towards “making sense of the anthropocene” will be both a collective and individual one. 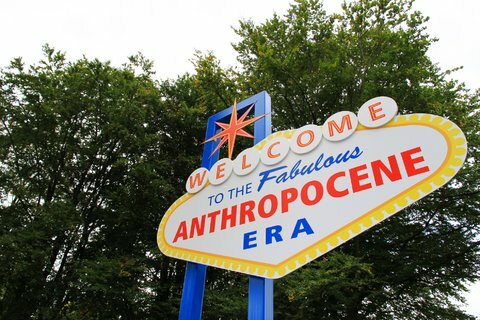 Robyn Woolston’s 2013 art installation at Edgehill University in England prompts us to think about what it might mean to enter into the anthropocene by riffing on a famous Las Vegas sign. Our journey into the Anthropocene will be shaped by our interactions with a series of guest speakers known as Davies Fellows. Davies Fellows–cutting-edge thinkers, writers, activists and artists who are engaged in their own attempts at “making sense of the anthropocene”–will give a public talk or workshop and also engage with us during class time. The seminar-style class will be student-centered, meaning class discussions will be led by students. Students will also collaborate in giving shape to how, individually and as a class, we want to make a statement or expression of what it means to live in the Anthropocene. Davies Fellows will guide us by sharing the creative processes through which they produce their own interpretations of the Anthropocene. Critical Reflections (25%)—One-page reflections on the week’s readings and interactions with Davies Forum guests. Due Sunday evenings by 9pm. First reflection is due Sept. 11. Discussion Facilitation (20%)—Each student will be assigned with a partner to facilitate discussion during two different class sessions. You will turn in a Plan of Facilitation by 9pm the day before your assigned class sessions. The Plan of Facilitation should include a synthesis/summary of the readings of the week and a series of questions, organized into themes or areas of focus, that you believe will allow the class discussion to delve deeply into the week’s assigned reading. Creative/Artistic Project (20%)—To be discussed. Personal Manifesto for “living the Anthropocene” (20%)—You will articulate through writing, video, or other media how your interpretation of the Anthropocene gives shape to the set of obligations, responsibilities, ambitions, hopes, strategies and practices you would like to embrace for living in the Anthropocene. Class Participation and Attendance (15%)—As a Davies Scholar you are expected to arrive prepared by having completed the assigned reading for the week and submitted a critical reflection. If you do these two things, your participation in class discussions will be meaningful, thoughtful, and engaging. Attendance is expected and required. You will be permitted one unexcused absence over the course of the semester. Additional absences will result in the lowering of your participation grade. Each component of the course will be graded on a 100-point scale, weighted as indicated above. There will be no rounding in determining final grades and no extra credit offered. Most readings are available freely on the internet. Links in the schedule below will take you to them. Other readings will be available in a Google Drive folder that will be shared with you. The following are the books that you will need to buy. They are not available in the USF bookstore but can easily be found new or used at a range of online bookstores. There are also inexpensive ebook options that you might want to consider. Sep 12–Anthropocene: What’s at stake? Aaron Czerny is a trans-disciplinary artist engaged in examining the contradictions between wildness and domestication and the line between the spiritual and tangible worlds. His current work focuses on themes of communication, migration and translation to interpret and transgress boundaries in the Anthropocene. Elizabeth Ellsworth and Jamie Kruse are artists and designers who pursue through their work “our most urgent and meaningful task as artists and humans: to invent and enact practices capable of acknowledging and living in responsive relationship to forces of change that make the world.” They are co-founders of smudge studio and of Friends of the Pleistocene, a blog dedicated to exploring sites and moments where the human and the geologic converge. Kristin Miller is an urban sociologist at the University of California, Santa Cruz. She is a writer, photographer and documentary filmmaker interested in the ability of web-assisted storytelling to instantly create connections to new ideas, places, practices, and states of being. Alicia Escott and Heidi Quante are artists and co-founders of the Bureau of Linguistical Reality, a public participatory artwork focused on creating new language as an innovative way to better understand our rapidly changing world due to manmade climate change and other Anthropocenic events. Kris Timken and Cynthia Hooper are multimedia artists whose poetic visual and auditory narratives, informed by research into the landscapes and systems represented, aim to dissolve pre-Anthropocene divisions between humans and nature.